We define risk culture as 'the shared perceptions among employees of the relative priority given to risk management, including the practices and behaviours that are expected, valued and supported'. Risk culture is only one aspect of broader organisational culture; other aspects that have been investigated across industries include Innovation Culture, Customer Service Culture and Safety Culture. However, in the context of banks, especially those considered 'too big to fail', the relative priority given to risk management is relevant to a range of stakeholders and is of particular interest to prudential supervisors. 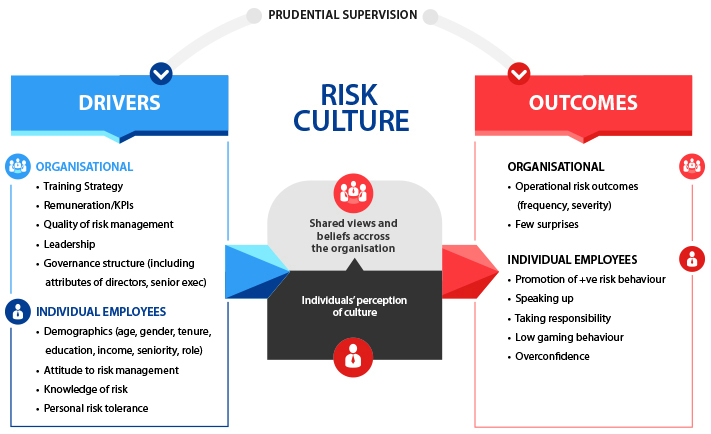 In our analytical model, risk culture is related to but distinct from risk behaviours (the outcomes of culture) and risk structures (the drivers of culture).